And so softly sighing they scattered their seeds. Hurling and whirling harsh rains high and wide. March started off feeling very Summery with no real signs of the change of seasons, but as the month progressed the nights started noticeably drawing in and getting cooler, and we often woke to a light mist in the hills. Then the first Autumn rains finally came to our little mountian side after a very warm, dry summer, not enough to fill our tanks or really noticeably benefit the garden mind you, but the thirsty, dry ground soaked up every drop and we could almost hear it sigh with relief. Circle Time verses this month have reflected the change in the seasons. Our complete collection of seasonal Autumn verses can be found <here>. 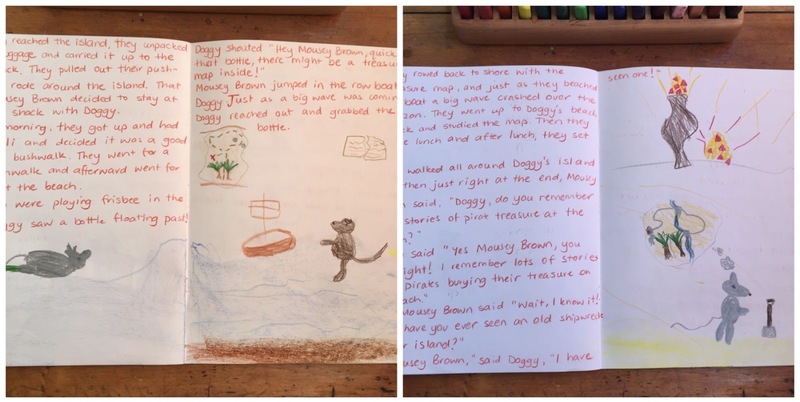 We read Chapter 4 of our Form Drawing story this week which can be found <here>. 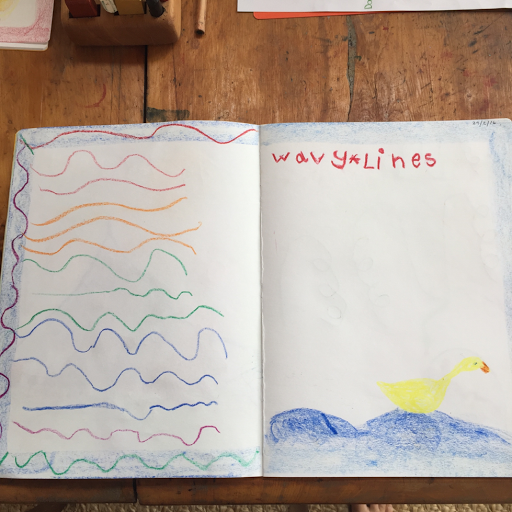 This week we practised wavy lines, some gentle and small like wind on the lake, and some large and bold like waves crashing on the beach. This week we received another Key of Knowledge, this time it was the Letter O. We explored the long and short sounds of the letter O and used the poem 'Mouse Goes Looking For A House' by Karen Lonsky which can be found on page 220 in the book 'Tell Me A Story'. I altered the original poem a little changing the 'rabbit' to an 'Owl' to suit our letter, and it gave the poem a lovely therapeutic quality addressing the issues of sharing and inclusion. BR: O tastes like... Oatmeal cookies! We also read Beatrix Potter's 'The Tale of Squirrel Nutkin' as a second owl story this week. 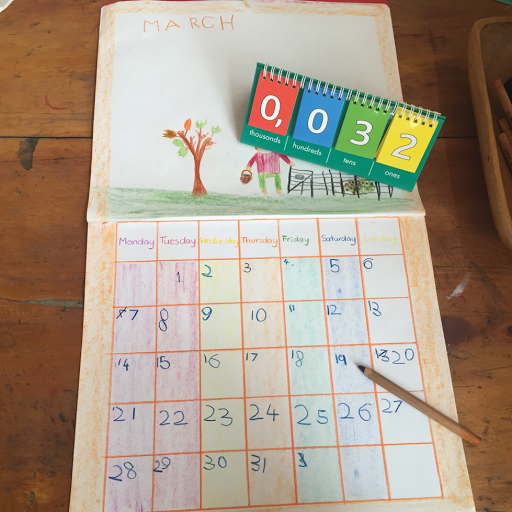 Our monthly calendar project continues to be a way to help Mr 7 unfold the concept of the passage of time, a precursor to History studies. 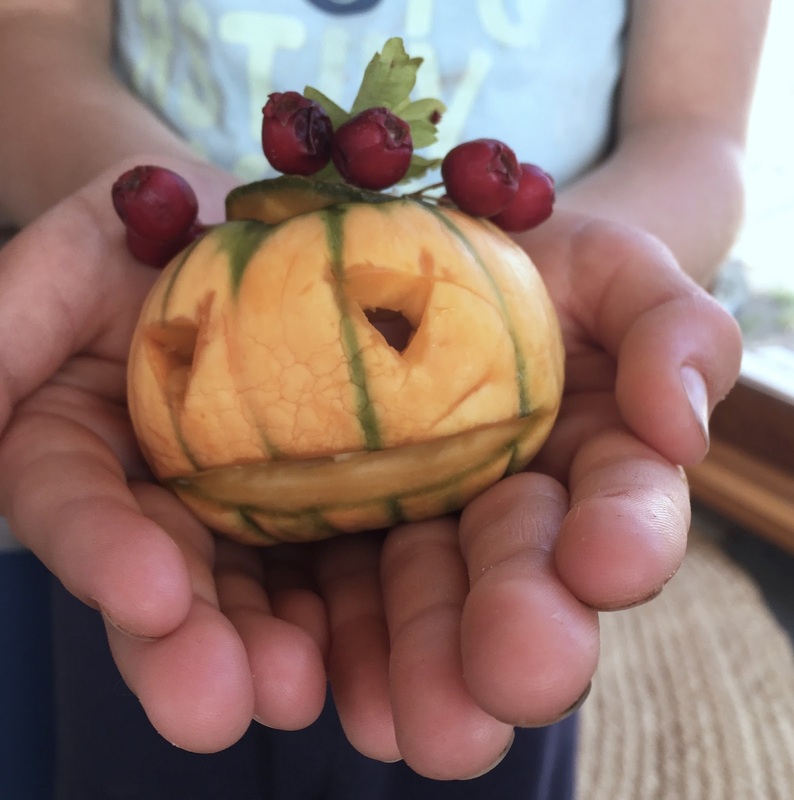 Mr 5's concept of time is still mostly based in observing the seasons, the natural world, and celebrating the seasonal festivals that mark our year. 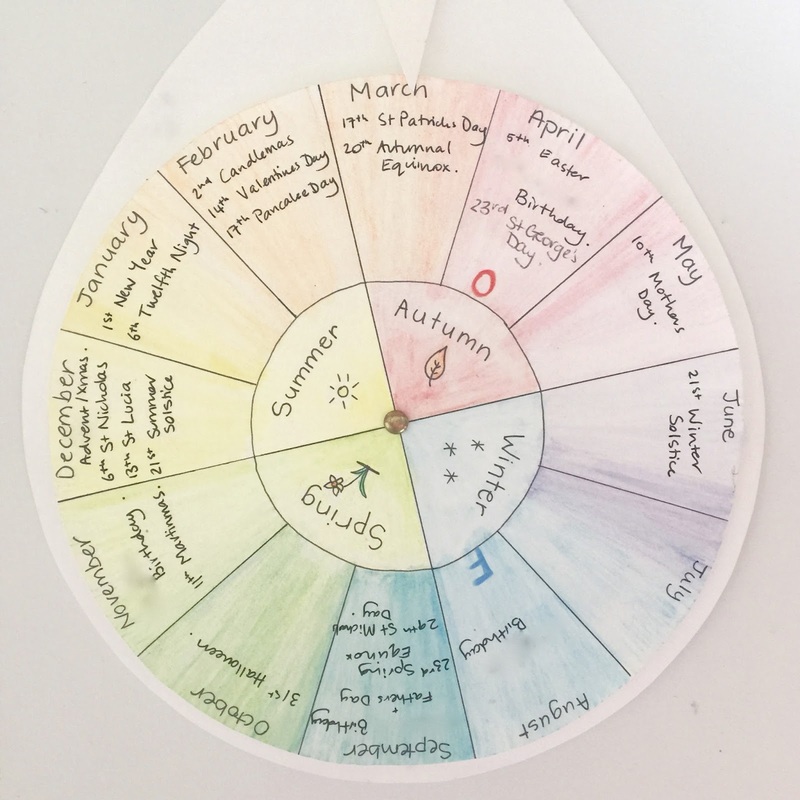 He also has his own 'weekly wheel' to mark the cycle of days and activities we do regularly. I used the concept of turning wheels from <here>, where you can download and print a wonderful free pattern. 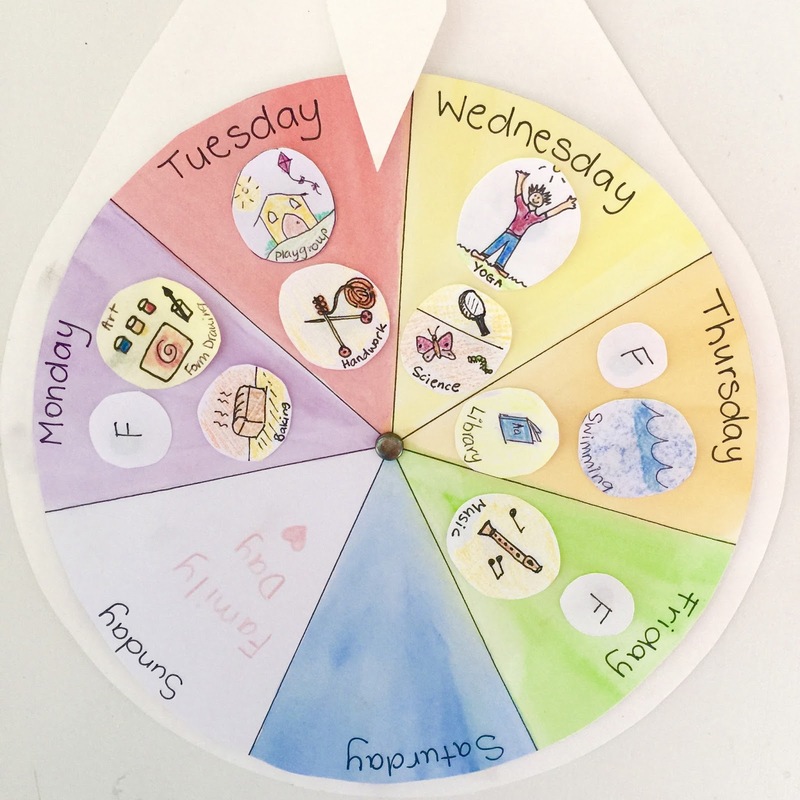 After having to redraw the whole 'Weekly Wheel' a few times, I decided to add little drawings to denote activities and stick them on with blu-tack, so that as our rhythm is tweaked or changes through the year, it is easier to adjust. We also add a drawing for special events or festivals that are coming up in the week. Mr 5 loves his own 'Weekly Wheel' and takes great joy in turning it every day and knowing what activities he can expect. It's also helpful for him to be able to 'count down' the days to a special event he is looking forward to. Our weekly rhythm this year is set around the regular external activities we have committed to. We have our Waldorf-inspired homeschool group on Tuesdays, we begin yoga classes on Wednesdays and have swimming lessons on Thursdays. These outings are all morning activities, so we try to do something at home in the afternoons. The other home days are we follow a different rhythm. 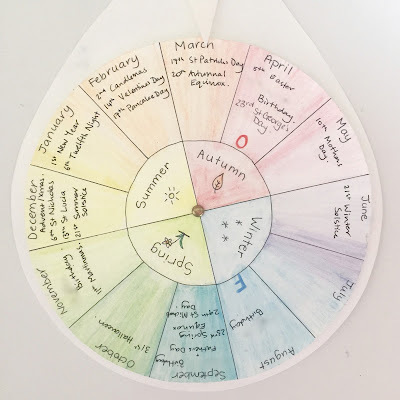 I have started very preliminary watercolour sketches on an Australian-themed seasonal wheel which I am hoping to finish in all of my spare time (haha). Social Studies also encompasses the study of Geography. We have been drawing 'treasure hunt' maps for a while now and introduced the compass last year. 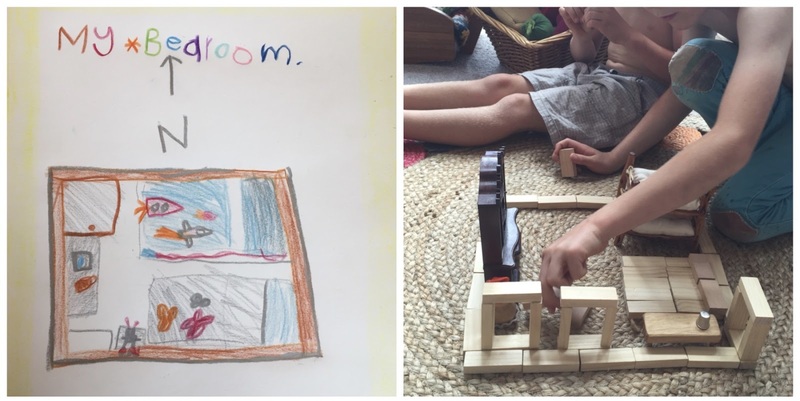 This week Mr 7 and Mr 5 completed a mapping project of their bedroom. We used compasses to work out the direction the room faced, and then mapped the rooms on paper. We also used blocks to make a 3D version of the same. Both boys enjoyed this project. The idea is to begin with their bedroom, gradually expanding outward to our home, our neighbourhood, our town, state, country and finally the world. 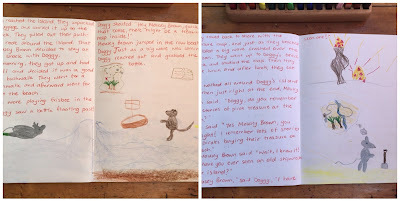 Both boys continued to dictate and illustrate stories in their Creative Writing Journals this week. This week marked the first official gathering of the new Steiner-inspired homeschool group, 'Children Of The Valley', held in a little cottage in our local area. 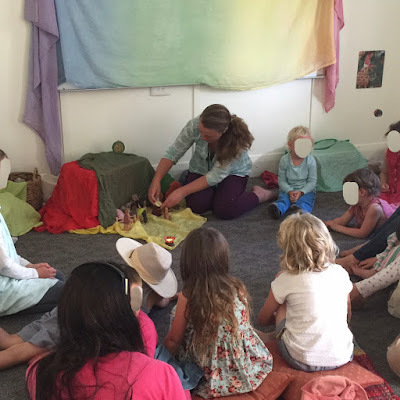 We met together for bread making, free play, circle time, morning tea, outside play and a beautiful story about the summer seed babies being tucked into their warm earthen beds in Autumn, told by a very clever mama who skilfully holds the attention of the children so beautifully. The children each took home a small handful of seed babies to plant in their own gardens and their very own playgroup bag to bring their fruit, drink and handwork in each week. On the weekend we took a break from house building and went on a lovely family walk to Pelverata Falls. In my mind I had not remembered this walk to be quite so challenging and, now in my third trimester, I had to stop right before the very end of the walk when the track became too difficult for me to navigate. I use the term "track" loosely, it becomes more of a boulder scramble at the end! :D It was a really lovely family outing though, and we are all looking forward to Stage 2 of the building being completed and having more time for family day walks again. That same evening we removed the temporary wall in the house which divided Stage 1 from Stage 2 of the build. A very momentous occasion and now our teeny house suddeny feels huge! 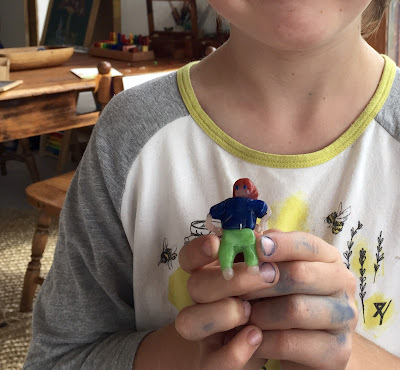 This week we read Chapter 5 of our story which can be found <here>. 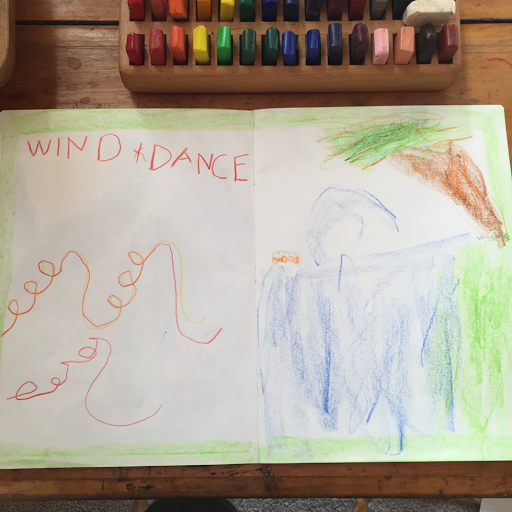 We practised a form called Wind Dance. 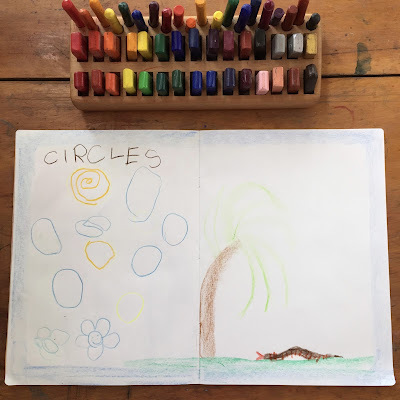 This form proved challenging for both boys to master, particularly left-handed Mr 7, who found it easier to draw this form mirrored as that way he could view the loops as he drew them. The final Key of Knowledge to unlock the written word, was given to us this week: the Letter U! We explored the long and short sounds of the Letter U and the form of the letter by using this sweet little poem about umbrellas. Soon woke the Dormouse—"Good gracious me!" —And that's how umbrellas first were invented. We also read the funny story from Madge A Bingham's book Overheard in Fairyland called 'The Origin of Toadstools' which can be found <here>. The boys loved this story. This week we had a theme of 'Apples in Autumn' for Children Of The Valley homeschool group. We listened to the story 'The Apple Cake' during morning tea and visited the sweet little community garden across the road to pick apples from the orchard trees there. The children then stabbed and dipped their apples in toffee to make their very own toffee apples. What a treat! We finished with a retelling of favourite story of ours 'The Little Round House', a version of which can be found <here>. During the week we went apple and quince scrumping in a nearby abandoned orchard. We spent a delightful warm, stormy day picking apples, pears and blackberries by the river. At the end of the week, we visited the local raw, organic/biodynamic honey producers Miellerie Honey. The children were taken through the honey shed and shown how the frames and honey is extracted. They even got to taste the different flower honeys and dip their own beeswax candles! I wasn't able to attend due to an appointment but the boys tell me it was a wonderful morning. This week we had another tooth-fairy visit, this time to Mr 7 who swallowed his tooth! He wrote this sweet little note for the tooth fairy, and popped it under his pillow with his tooth-fairy pouch. Rest assured the tooth fairy did indeed visit to collect the note and leave a beautiful crystal in the pouch. Phew! For .......... has now lost a tooth! To guard .......... while he sleeps. And wings o'er waves all wild with wonder. And never once their duty shirk. And then cry out, "Heigh-ho!" And bows to all of them. 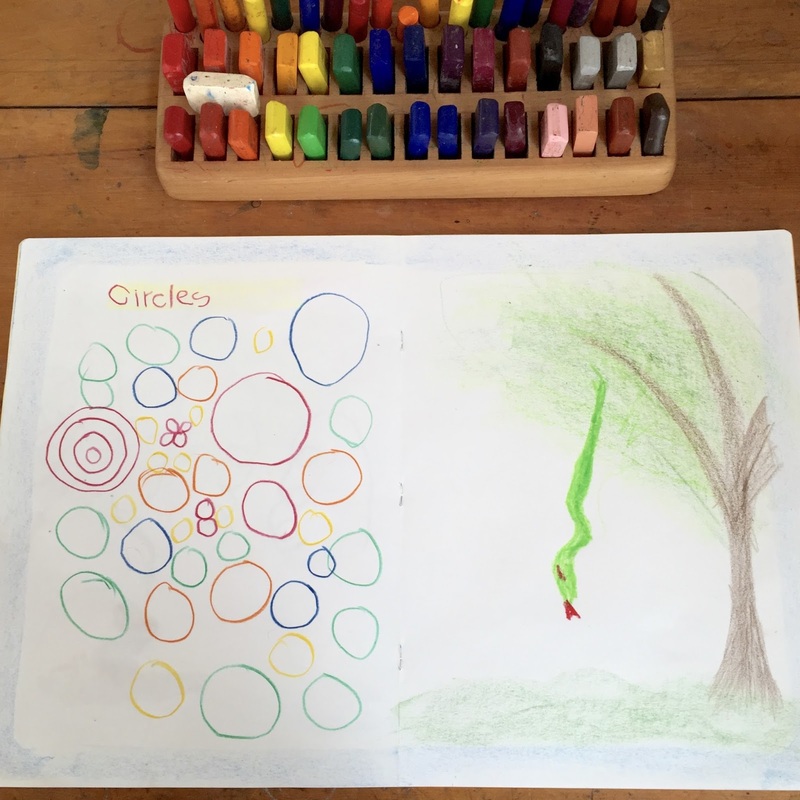 This week we read Chapter 6 of our story which can be found <here> and we practised circles as our weekly form. This week was a rather momentous week as we reached the very end of our Grade One alphabet journey and the end of our year long <Container Story>! Both boys were so proud of their work, particularly Mr 7 who finally finished off his year long handwork project needle-felting an entire alphabet bunting. It was such a nice feeling for all of us to round off our Container Story and finish Grade 1 Language Arts. BL: Mr 7's alphabet bunting project finally complete! This week we explored the Number 8 using The Gnomes Gemstones stories and a story from page 40 of the Waldorf Early Childhood book 'Tell Me A Story' called 'Mother Spider'. We are all really settling into the 'Children Of The Valley' homeschool group and finding a lovely pace. It's really nice to see the children settling into the rhythm as they become more familiar with it each week. This week we continued our 'Apples in Autumn' theme with apple verses and songs during Circle Time, a version of the story 'Why Do Apples Have Stars Inside?' from Madge A Bingham's book Overheard in Fairyland. The original story can be found <here>. 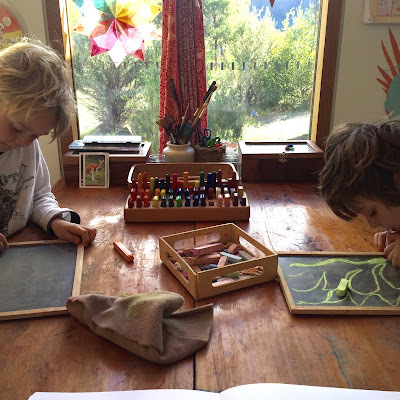 After outside play, the children came back inside to wet-felt these sweet little apples topped with a clove for their nature tables at home. During the week we celebrated St Patrick's Day. I finally got around to finishing our little St Patrick's Day Story Bag, the inspiration for the idea from <here>. This week we also spent a day foraging for blackberries as the blackberry season winds down, and we spent a lovely afternoon jamming them together. We also welcomed into our home, this lovely little gnome (which the boys have named Gas hilariously enough!) and the book we have been anticipating for so long 'The Way Of The Gnome' by Sieglinde De Francesca. We bought both treasures from a lovely local homeschooling family run online store Spiral Garden. The first book in the series 'A Donsy of Gnomes' is one of our family favourites. I've lost count of the times we've read it! The author's website Teach Wonderment is <here>. This week we read Chapter 7 of our story which can be found <here> and we practised waves as our weekly form. This week we explored the Number 9 using The Gnomes Gemstones stories and the well known Russian folktale 'The Enormous Turnip' a version of which can be found <here>. The story is also known as 'Hugin and His Carrot', a version of which can be found <here>. I added 8 farm animals to help our farmer pull the giant vegetable, so there were 9 helpers in all. As I am now in my third trimester, we also explored the 9 months of pregnancy and had a brief look at baby development each month. Mr 7 decided to use this to draw in his MLB. TR: handwork: Nine-pin gnome bowling! Both boys continue to dictate stories for me and then illustrate them. This is one of their favourite activities to do and their story telling is developing nicely. They have set themselves a goal each to try to fill the entire MLB with the one story! Handwork: Mr 7's beeswax "self portrait"
The Autumn Equinox fell on the Sunday this year, and we spent the day working on the house and in the garden. We dug the last of the spuds and feasted on a harvest meal sourced entirely from the garden - fresh salads, freshly picked corn and tomatoes, and new potatoes with butter and garlic chives. During the day we also popped along to the Huon Small Farms Expo for a look. The story I chose for our Autumn Equinox gathering was from page 56 of 'Tell Me A Story', a story called 'Mother Earth and the Leaves', and as the last of our Russian Giant sunflowers have drooped their heads as their season comes to an end, I found this sweet little story to tell also, 'Why The Sunflowers Hang Their Heads' . We observed Easter in the following week in a fairly low key way this year. 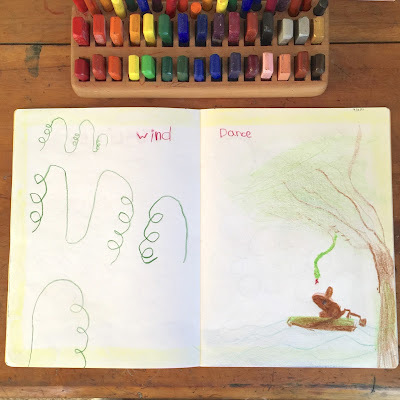 We listened to Martin & Sylvia's 'Whole World Easter' series by Sparkle Stories which offer a story every day in the 10 days lead up to Easter, and bring a nice comparison of Easter in Autumn for us in the Southern Hemisphere and Easter in Spring for the Northern Hemisphere. The audio books explain the Christian story of Easter in a way that is gentle for younger children. I also told <this> Australian story of Easter in Autumn. We spent the Easter weekend as a family, baking hot cross buns, making hazelnut chocolate paste from nuts we collected, dipping beeswax candles, folding origami Easter Hares, and decorating the Easter Tree with watercolour painted eggs. Easter Sunday was, of course, begun before the sun rose with an egg hunt in the garden. Only a few eggs were stolen by cheeky quolls in the hours before daybreak! Hermoso todo lo que hacen !